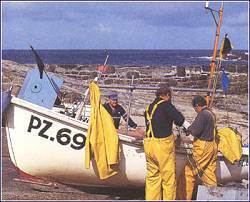 Located on the western edge of Penzance, Newlyn is home to the largest fleet of fishing boats in the South of England. 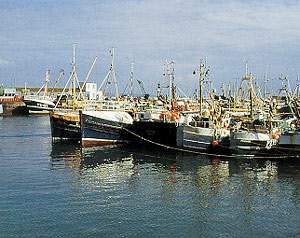 Newlyn, is clustered around the harbour, with its original quay curling around a few small boats on the western side and the much larger quays in the centre and on the eastern side of the harbour. Newlyn harbour is the home base of the local lifeboat, the 'Mabel Alice', a replacement for the ill-fated 'Solomon Browne', which was sadly lost at sea with all hands some twenty years ago - thereby serving as a reminder of the hazards faced daily by those who earn their living from the sea. . The bustle and activity of Newlyn gives the visitor a quick glimpse into a hard-working industry. On a road leading back from the harbour, you will find the Pilchard Museum - established to show how this small fish - once the major product of the local industry - was processed and packed for shipment to destinations all over the world. Newlyn is synonymous with one of Britain's great art movement's - the Newlyn School. 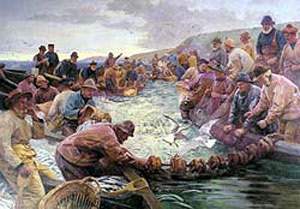 The movement flourished during the late nineteenth century, with Newlyn very much at its focus, inspiring artists such as Stanhope Forbes to capture the area on canvas. Penlee House is home to the historic collections of Penzance Town Council, Penwith District Council and Newlyn Art Gallery. A programme of changing art exhibitions focuses on the historic art of West Cornwall, usually including the world famous 'Newlyn School' artists, such as Stanhope and Elizabeth Forbes, Walter Langley and 'Lamorna' Birch, who lived in the area from 1880 to 1940.